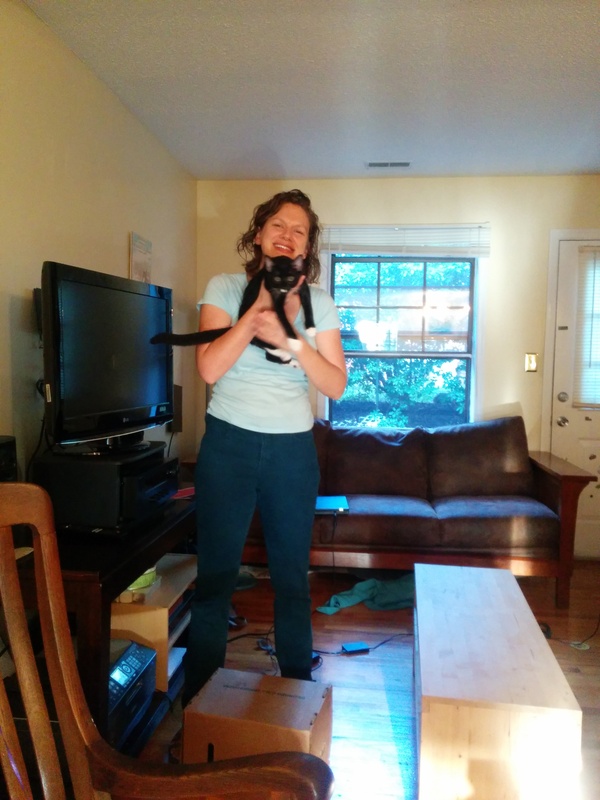 So I made it to Asheville after a much longer drive than expected (thank you, Max and Dottie! ), and just in time to get to Mom Marcie for the ride up the mountain to the lovely place where Karie and Rob would have their ceremony. The site was on a verdant property owned by friends of Karie and Rob. 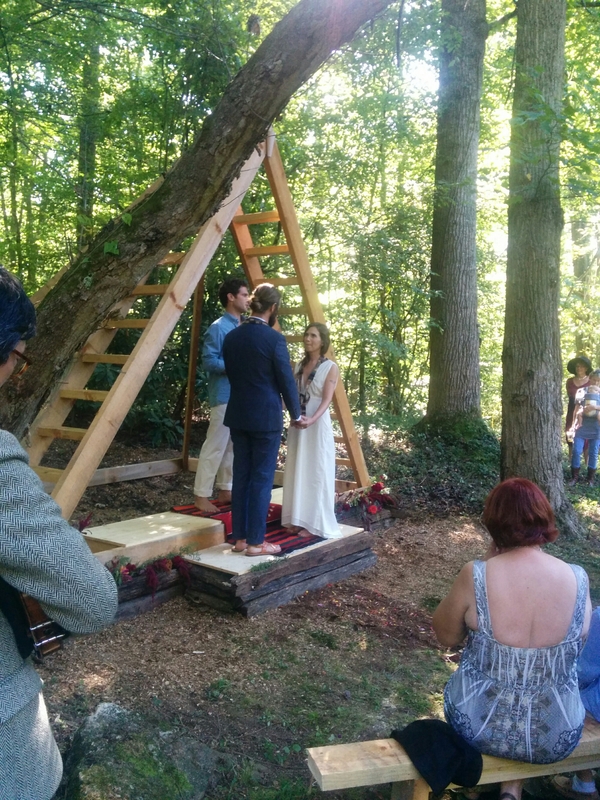 They had organized everything beautifully: an area for those who would camp–including a friend’s tiny house and a yurt/yom–and a place for a bonfire, a large tent for the reception and a little booth for funny selfies to be made. The tent was decorated with lovely wildflowers, and lights strung around hula hoops. They had arranged for everyone to get their own glass mug for the evening’s libations and as a souvenir to take home. And so many creative, artistic friends chipped in to make the abundant food and provide the music! A harpist, even! I was particularly impressed with the BREAD: a baker friend with a wood-burning oven made 50 loaves of the most divine bread for the event–I even got to take one home. The whole atmosphere reminded me of Portland in the 70s: lots of babies in slings and toddlers with old-fashioned names like Winifred and George, and DJs who were–to my great amusement–playing old Willie Nelson LPs! (It’s so funny to be so old that what you used to do has become hip again…) These young ‘uns, though, seem a bit more together and less naive than we 60s hippies were. The biggest difference was that so many of them today have elaborate tattoos; in the 60s, tatts were solely the aesthetic of bikers, biker chicks, and sailors. We had to wait a while before we walked up to where the ceremony would be (Marcie said that she always used to tell Karie she’d be late for her own wedding, and sure enough, she was!). The ceremony was up a beautiful wooded trail, which we traversed behind a fiddler leading us up the hill. Karie and Rob and their friends had constructed a wooden altar with vaguely Native American symbols and motifs. The most stunning part, I thought, was that Rob and Karie walked down from the property’s house together, along a wood chip and flower-strewn path. Another friend had made her very simple and elegant gown, and she held a simple bouquet of native flowers. Rob looked very handsome in his suit, pulled-back hair, and sandals (that I assume Karie made?). A barefoot celebrant conducted the ceremony (a friend who got one of those Universal Life minister certificates to officiate), and a friend read an Apache poem as blessing. Rob and Karie put some symbolic evergreens at the top of the altar, then they read vows and kissed, and looked very happy. The reception was filled with great food and lots of conversations. I was, of course, with the parental relatives and friends, and enjoyed meeting all the women, including some very intelligent aunties who reminded me of George’s own aunts. Finally, we got to the toast and cupcakes. Marcie made over 200 cupcakes plus a little wedding cake, which we all stacked onto trays on a table from which the kids started to swipe samples. Eventually toasts were made, and as it was getting dark, we walked down a luminaria-lit path to the van to take us home. I was really pleased to be part of this event–to see so many talented artisans expressing so much friendship and having such fun, and to see such a gorgeous part of the area around Asheville. I’m happy to see a thriving artistic community of young people, and it was so nice to be a part of Karie and Rob’s special, special day. They seem immensely happy and made for each other. You will have happy and creative days ahead, you two! Yesterday I made a birthday pie for Max (his birthday is on Sunday). It’s always hard to cook in other people’s kitchens, and pie dough has a completely different consistency than I’m used to, but the apple pie was delicious! And here’s Dottie at last, off for a few days from her grueling schedule! They love their kitty! A decent flight sitting next to a very sweet young Canadian couple flying, as I was, to a friend’s wedding. This seems to be a major pastime of late-20s-30-somethings right now. Max and Dottie have been crossing the country for the last few years to all their friends’ various merging ceremonies. Carolina weather is certainly a change from LA! So much more humidity, so that even though it’s only about 70, we’re sweating. Good for the skin and hair, though. So good to see Max! Haven’t seen them since Christmas! Dottie is on her brutal 12- hour shifts, so I haven’t yet had much time to talk to her. I was able to walk quite a bit to the shops, then around UNC campus. Kitty cat Freddy is a love. Didn’ t cry at the bedroom door last night, even though I had taken over his room. When I got up in the night, he came into the bathroom and put his paw on my foot. So sweet. Let’s go to North Carolina! BUT enough of that! I’m off to North Carolina tomorrow, first to see Max & Dottie, then to have them drive me up to Asheville for a mountain wedding of the daughter of an old high school friend. this should be fun, and I want to see how beautiful Asheville and the North Carolina countryside is. I’m going to try to remember to write something here every day. I’ll try to include some photos, too.